I have noticed a trend in the North Phoenix area of hotels converting into senior living facilities. The first one was the former Embassy Suites at 2577 W. Greenway Road. Built in 1986, this all-suites hotel offered 168 guestrooms where every room was a 2-room suite. The website went offline in 2015, and the 17-acre property began the transformation to its present status as "Park Terrace at Greenway." Prior to its closure, the hotel's ratings took a nosedive, with an average score of 2.0 out of 5 on Yelp with 74 reviews. The new property offers four different floor plans for seniors, ranging from 504 square feet to 1,208 square feet. The next to go was a 166 room hotel located at 2641 W. Union Hills Dr. 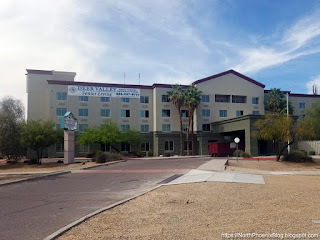 It has operated under many names over the years including the Ramada Midtown, Park Plaza Phoenix North, Comfort Inn Phoenix North, and most recently, Plaza Inn & Suites. It is now renovated and operating as "Bridgewater Assisted Living." Like the Embassy Suites, this one had pretty bad reviews as a hotel. The website HotelPlanner records that the property had 2.5 out of 5 stars with 196 reviews prior to its closure. The most recent North Phoenix hotel to convert to a senior home is the former Country Inn & Suites, located at 20221 N. 19th Ave. The 126 room property was built in 2000 and sits on 5 acres of land. Unlike the other properties, this one had great reviews prior to its closure - 4 out of 5 stars with 441 reviews. A banner on the property announces the new name as Deer Valley Senior Living. 1. With so many newer hotels in the Happy Valley/Norterra area, the supply of hotel rooms in the North Valley is greater than the market demand, causing low occupancy and cutthroat rates. 2. With so many baby boomers retiring, there is an increased demand for senior and assisted living care facilities. Converting a hotel saves on cost versus building a brand-new property from the ground up, and it's also faster. 3. Hotel properties typically include all of the facilities needed for senior care, such as on-site laundry service, meal preparation, and large lobby/conference room areas that can easily be repurposed as activity rooms. 4. Don't quote me on this, but I believe that in Phoenix, the same type of zoning that allows for a hotel also permits multi-unit housing. The properties can quickly be turned around without a re-zoning hearing. 5. North Phoenix has two age-restricted communities already, which are the Friendly Village of Orangewood at 27th Ave and Union Hills and the Sand Dollar Apartments. Will more North Phoenix hotels convert to senior living in the coming years? If the current trend is any indication, then the answer is likely a "yes."